Where&apos;s the primo place to be when spring hits? Savoring a craft cocktail or noshing creative cuisine at one of Austin&apos;s outdoor dining spots, of course. Nothing beats basking in the sun with a few of your favorite people on a lazy Austin afternoon. Start your rooftop journey in the Warehouse District. Hangar Lounge, designed after a 1950s airport lounge, offers an amazing rooftop overlooking the city. The average cocktail price runs around $8. Or spend the evening dancing at Terrace59, the rooftop lounge at Speakeasy and one of the top places in Austin to take in the glittering skyline. Be sure to catch the sunset happy hour with $3 cosmos, domestics and house wine. When it comes to kicking back al fresco, Red&apos;s Porch is arguably one of the best spots in Austin. Enjoy great happy hour deals – $2 Lone Star pints and $3.25 RED&apos;s Frozen Ritas – in the downstairs garage, featuring retractable doors that open up to a sprawling patio; or dine on quality bar eats on the spacious upstairs porch. At School House Pub, you&apos;ll find locals casually sipping Texas-brewed beer on the sandbox-inspired patio, where brews range from $2.50-$6. Visit hip and historic Hole in the Wall – a legendary, vintage club founded in 1974 that holds a special place in Austin&apos;s music scene – and relax on the intimate side patio while the sounds of local bands trickle through the open doors. (We recommend $2.75 Shiner drafts) Be sure to snack on delicious bites from raved-about food truck, Michi Ramen. Shady Grove&apos;s sprawling, pecan tree-shaded patio is the perfect place to enjoy a laid-back lunch in the sun with a cocktail in hand ($7). It&apos;s also one of the best places to catch a show thanks to the venue&apos;s Unplugged music series. 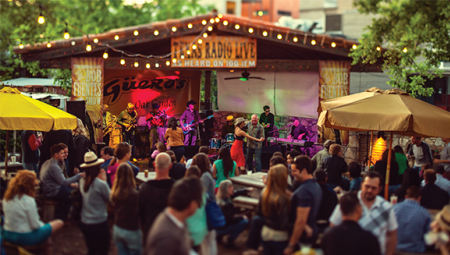 In South Austin, sit back with a cold cerveza in the Oak Garden at Gueros Taco Bar (pictured above), an Austin tradition serving fresh dishes, handmade tortillas and a to-die-for salsa bar. Sip their signature margarita for around $7.75.